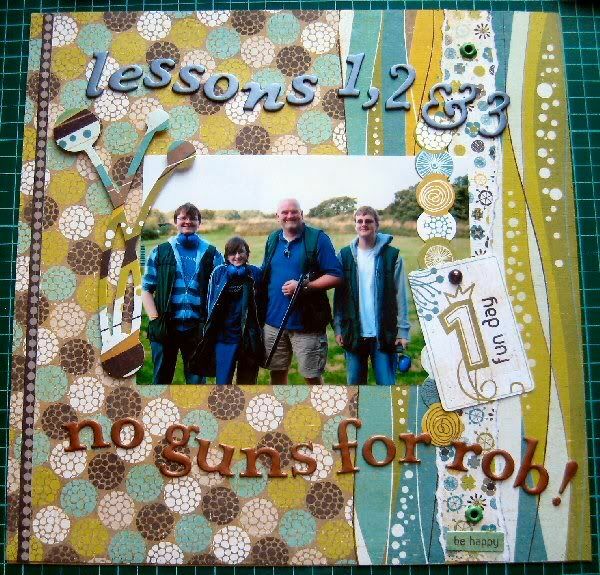 Not from a class but one I started on the first night I was there, Rob won't be let loose again on a shooting range anytime soon. That gives a really good feeling of family. Good fun. Love it. You're so right, it all has to appear, life's not a bowl of cherries and shouldn't be depicted as such, and at the time you probably thought he was slightly less of a numpty head LOL, love this one, and why no with the guns, spoilsport. Those tall branch/flowers are great for blokes. No with the guns as he took a window out! Nice colours and go very well with the photo. OO bad lad,lol. THis is another great one. fabulous background and great layout and the thing i like best is your attitude about the whole 'have to include numpty head' thing. i love this lo ,the colours are great . i know its not great for you , but you do need to do lo's with dad in for the boys so well done on that . I love the colours on this. Where do you get all the chip board from, you def have some fabulous stuff. Gorgeous this one. well done.